Homepage. This page: Classic Dolomite picture. From memory I can't remember exactly what model of Dolomite this is - I think (despite the Sprint alloys) that it is the 1850 model. This is a late-production example of the Dolly and in mint condition. Triumph Books Whether for the Dolomite as shown below, or any other type of Triumph, it is worth having a look on Amazon for books, DVDs, Videos etc. Have you seen today's eBay auction listings for the Triumph Dolomite? Pictures of Triumphs and other classic vehicles. 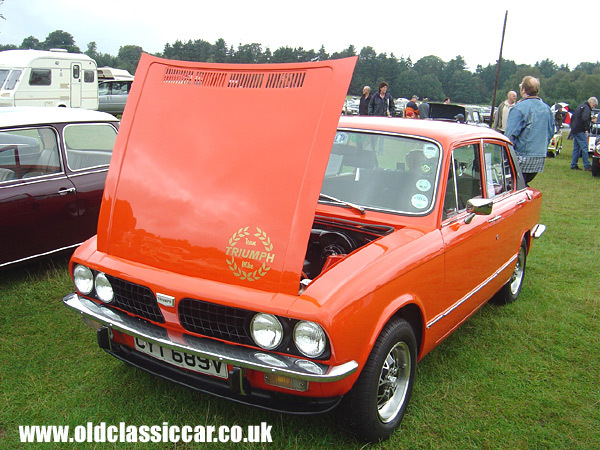 There are thousands of pics in the oldclassiccar gallery in addition to that featured above, showing a well looked after Triumph Dolomite in the last few years. I took all the photographs unless stated otherwise in this particular collection - thumbnails of the other images in this set can be found on the misc classic vehicle photographs set 3 page. To see a rundown of all the picture collections, and maybe find more examples of Dolomites, please visit the main car, van and lorry photo section.